All students who live within the home zone described below* (and shown on the map below) shall be entitled to enrol at the school. Starting at 491 Te Irirangi Drive (319-491 odd numbers only included) travel through the walkway, along Monash Place, cross Wayne Francis Drive (97, 88 and above included) and travel east along Hampervale Place. Travel south down Chapel Road (350-408 even and 169-311 odd, included), east along Duntrune Road, north-east along Cyril French Drive (52 and below and 99, 100 and above included) to the roundabout with Middlefield Drive. Travel south along Middlefield Drive, east along Bronwylian Drive, south-east along Cyril French, back to Middlefield Drive. Continue south on Middlefield, east along Amon Avenue and Coachman Drive, cross east through Gracechurch Reserve and travel south along Gracechurch Drive then west along Jeffs Road (excluded) to the intersection of Stancombe Road and Murphys Road. Travel south along the centre of Murphys Road (274, even numbers only, and above included) and west along Multose Drive. Travel north along the eastern side of Sir Barry Curtis Park and west along Stancombe Road. Travel south along the centre of Chapel Road (western side only included), west along Ormiston Road (100 & 128 only included) and north along both sides of Ti Irirangi Dr to Bishop Dunn Place (included). Continue north along the centre of Te Irirangi Drive (eastern side only included) back to the starting point. 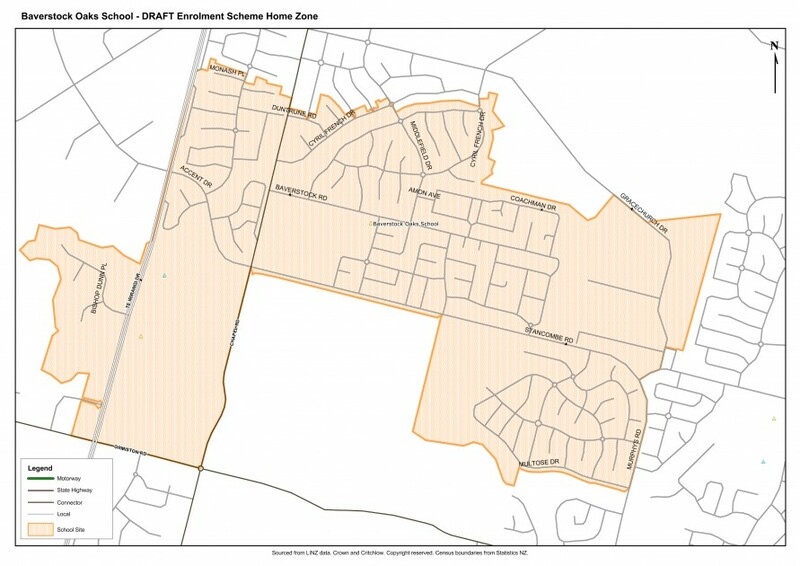 Each year the board will determine the number of places which are likely to be available in the following year for the enrolment of students who live outside the home zone. If there are more applicants in the second, third, fourth, or fifth priority groups than there are places available, selection within the priority group will be by a ballot conducted in accordance with instructions issued by the Secretary under Section 11G(1) of the Education Act 1989. Parents will be informed of the date of any ballot by notice.